In a lute tablature manuscript, now housed in the Lund University Library (Wenster G 34) and dating from the beginning of the 18th century, you can find the following entry: "Luthenisten Pourells i Stockholm Stÿcken på 4 fölljande arken [the pieces of Pourell, lutenist in Stockholm, on the following four sheets]". This entry is the starting-point for this article and I will return to a description of the relevant contents of the tablature manuscript later on. Who was then the lutenist Pourell in Stockholm? 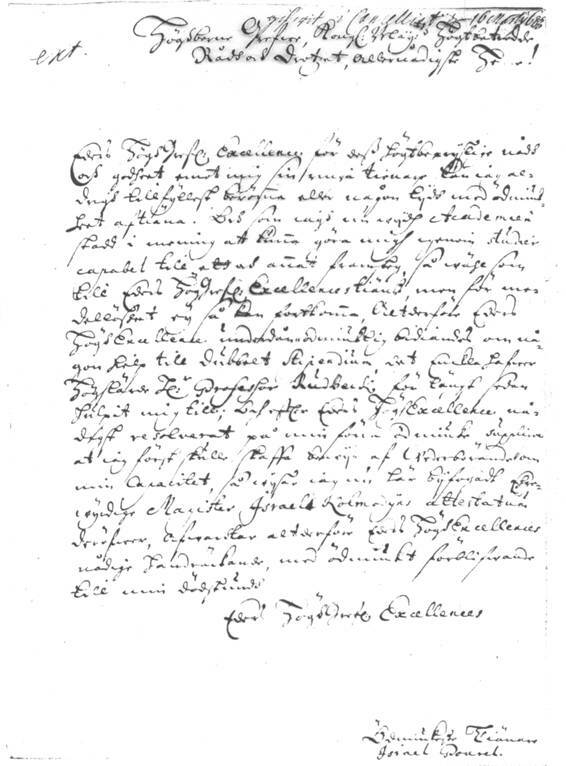 There is a scarcity of information on Swedish lutenists working outside the royal court and due to this Pourell is particularly interesting as he doesn't seem to have had any employment at the court. During the late 17th century the following lutenists were employed court lutenists: Johan Bengtsson (1656-1673), Hinrich Niewerth (1666-1699) and Gustav Düben the younger (1685-1688). There seems to have been no lutenists employed after 1700. Allemande (fol. 1), Gavotte and the beginning of Gavotte C'est l'amour (fol. 40) from the lute tablature manuscript Wenster G 34, Lund University Library. Pourell's full name was Israel Pourel. He was the son of the "fransyske Hofspråkmästaren" [the teacher of French at the court] Bertram Pourel and his wife Catharina Grubb. Bertram Pourel is probably identical with the Bartholomew Pourel de Hatrize who in the 17th century published two French grammars in Sweden: Court et droit sentier à la langue françoise... in 1650 and Tabula rudimentorum lingue gallicæ... in 1664. The first book was dedicated to Queen Christina and the second to King Charles XI. Bartholomew (Bertram) Pourel came from Hatrize, a small village situated between Verdun and Metz in the department of Meurte-et-Moselle, arrondissement Briey in Lorraine. This part of France was severely affected during the Thirty Years war and in 1635 the village of Hatrize was ravaged and burnt by the Swedish army , which used this part of Lorraine as a source for maintenance and supply for their actions in Alsace. At this period, from 1633, Sweden was allied with France. Anyway Bertram Pourel must have arrived in Sweden before 1650, and in the preface to his first book he wrote: "Hwarföre effter jagh någhen tijdh, såsom en fremmande och här till nästan som en Peregrinant, här uthi Götharijket wistats hafuer... [since I as a stranger and almost as a traveller have stayed in the kingdom of the Goths for some time]". In 1658 Bertram Pourel met Catharina Grubb in connection with teaching her brothers in French. At this time Catharina was married to a Jakob Mårtensson, secretary to count Schering Rosenhane. However, Jakob died in 1658. Bertram Pourel had also been married earlier and had three children (two of which probably were named Samuel and Abigail). The betrothal between Bertram and Catharina occurred in 1658, but we have no information when they were married. From the 1670s there are several entries about Bertram Pourel and Catharina Grubb concerning a conflict between them and the mayor and the council of the city of Nyköping and a person called Johan Snack. This indicates that they may have in lived in this city for some time. The marriage between Bertram and Catharina resulted in four children: Johan Ludvig, Chrispinus, Israel and Agata Sofia. Israel was probably born in the mid-1660s. In his early age Israel became fatherless as Bertram Pourel in the turn of the year 1667/1668 was beaten to death in Stockholm, probably by a Matthias Larsson Falkensten. When the case was investigated it seems as if Falkensten since 1667 was indebted to Pourel and thus it may have been an economic conflict that caused the assault. In the legal procedures it even was suggested that Catharina Grubb and Falkensten, who was a relative to Catharina, had conspired to murder Bertram Pourel. The relatives of Pourel later tried to get money back from Falkensten's family and the legal proceedings concerning this matter lasted until the end of the 17th century. However, Falkensten was never sentenced for the assault on Pourel and he later served as a captain at the regiment of Västmanland. At his death Bertram Pourel left a house at Norrmalm at "Muncklägersgrunden" in Stockholm, two portraits of King Charles Gustavus X and Queen Hedvig Eleonora, about 130 books etc. Probably the "Muncklägersgrunden" could be interpreted as "Muncklägreetz grändhen", a 17th century name for the present Gamla Brogatan, a street in the centre of Stockholm. There were several legal proceedings concerning the distribution of the estate after Bertram Pourel. Before he died he also had pawned a sealed trunk with the businessman Johan Adlercrona. Bertram's wife, Catharina Grubb, later married to a Christopher von Bergen. [Your Excellency's most gracious care for me fatherless child gives me a humble hope to be provided with something for the continuation of my studies and my subsistence before Your Excellency leaves to the regrets of this poor child. The last time I was left I did not get food in the house and I have not received any clothes for three years and furthermore no tuition in my studies. I am therefore forced to refer to the last gracious resolution, copied under lit. A, and with the most humble appeal to be in receipt of this. As the German teacher no longer stays in the city I hope most graciously to get tuition from someone else who Your Excellency would command to fulfil this duty. I also would be pleased to receive tuition in French from my brother who stays here now and who has made a profession of tuition in this language. As being under Your Excellency's patronage I humbly appeal to be in receipt of this resolution. I will fervently pray to God, who is the father of all fatherless children, that his almighty power many times, now and forever, will bless and crown Your Excellency. According to Pourel himself he at a venture went to Uppsala in order to study at the university: "altså iagh uthan recomendation blått och baar begaf mig till Upsala, [war]äst H:r Professor Olaus Rudbeck migh förhiälpte under Musiquen till ett Stipendium nembl: 120 dollar kopparmynt..." [I went to Uppsala without a letter of recommendation but professor Olaus Rudbeck helped me to a scholarship in music, that is 120 copper dollar...]. On 16 March 1681 "Israel Pourel Holmensis" was registered as a student at the Uppsala University. He studied in "Classe Theologica" and at an early stage he was referred to as "Musicus [musician]". His studies did not last for more than two years, up to the autumn semester 1682, probably due to a lack of means to continue, but during his stay at the university he made a name of himself as a musician. Jagh beder om ursäkt at iag så länge fördröjt at swara på hans bref. Monsieur begär af mig et testimonium om sitt lefwerne och förhållande här wijdh Academien den tijdh han här warit, deslijkes om sine studier och exercicer; hwilken hans rättmätige begäran iag kan mig så mycket mindre undandraga at efterkoma som icke allenast mig, uthan allom här å orten nogsamt kunnigt är, at han här fört et wackert och skickeligit lefwerne, deslijkest moget och wähl idkat sine studier, särdeles studium Eloqventiæ, warandes det dertill et nogsamt klart bewijs, at han ännu, ehuru han en rund tijdh ifrån Academien warit hafwer likwähl hela blad och capitlen af dhe wackraste Autoribus memoriter läsa och upräkna kan. Till samma sina wackra studier har han och tillagt det, hwilket mycket till berömmandes är at han i den angenehmaste konsten ibland alla artes liberales, Musiquen nembl. sigh wähl exercerat och så färdig giort, at iag kan räkna honom för en af dhe Principales, som här iblandh Studenterne uthi Musiquen under min direction warit hafwer. Hwilken berömlig exercice han sedermera, sedan han Academien qvitterat hafwer, eij tillbaka satt, uthan så handhaft, at han på dhe rareste musicaliske Instrumenter, nembl. Luta och Harpa sig öfwat och färdig giort. Kunnandes iagh efter hans begäran eij obilligt här med betyga, det han är den endeste och förste bland studenterne här wijdh detta Kongl: Universitet som sigh med et wackra Instrumentet K: Davids Harpa befattat hafwer, som är så mycket mehr lofwärdt, som han uthan någon anledning eller någors Instruction derpå nådt en wacker perfection. Hwarför förtiänar han med skähl som han och påstår, at han för månge andre som willia heta Musici, ehrnå den Hedren at nämbnas Musicus Literatus. I apologise for not having answered your letter for so long. Monsieur is asking for a testimony about his behaviour and his conditions at the university during the time he has spent here as well as about his studies and training. This legitimate request I cannot deny him as it is well known not only to me but to all in this place that he has behaved very well and studied in a diligent and mature way, particularly in "studium Eloqventiæ" which is proven by the fact that he, in spite of his absence from the university for quite a long time, still is able to read and enumerate whole pages and chapters by the best authors. To these studies he has also added commendable exercises in the most pleasing of the artes liberales, that is music, to the extent and perfection that I have to mention him among the best of the students in music which have been under my direction. These exercises and skills he has furthermore continued after having left the university and maintained them in such a way that he has exercised and perfected himself on the sweetest of musical instruments, that is the lute and the harp. I can by his request certify that he is the first and only among the students at this university which has dealt with the beautiful musical instrument King David's Harp. This is even more commendable as he, without ground or tuition, has attained perfection on this instrument. He deserves thereby, with his own good reasons, among other musicians to be appointed Musicus Literatus. Obviously Pourel had a great talent in music and Rudbeck even calls him one of the leading among his students of music. Already Magnus Gabriel de la Gardie had, as mentioned above, observed Pourel's "exceptionally beautiful voice". This meant that Pourel could rely upon an active support from Rudbeck, as the latter highly appreciated good musicians. The musical life at the Uppsala University was very rich during the 17th century and Rudbeck was the leading figure. For a long time he strived for an accepted and firm position for the music at the university. There existed a long tradition that the "rector cantus" should twice a week between noon and 1 p.m. give the students tuition in playing musical instruments and in singing. Among the most skilled students of music five singers and five instrumentalists were chosen and should be at disposal for divine services and other solemn occasions. Rudbeck also had many musical instruments both privately and for the university's disposal. In 1685 he had no less than 38 instruments (11 violins or viola da gambas, 8 flutes, 3 shawms, 4 curtals, 8 brass wind instruments, 2 spinets, 1 clavicimbalum and one theorboe) "föruthan lutor, bandorer, citrinkia, Davids harpa, små flöiter och skalmejor som eij pläga brukas i kyrkan [not to mention lutes, pandoras, cittern, David's harp, small flutes and shawms which are not used in the church]". As far as Pourel is concerned the most interesting to him probably were the plucked (theorboe, lute, pandora, cittern and harp) and the keyboard instruments. A great deal of attention was paid to the fact that Pourel played upon a so called "Davids harpa" [David's harp]. What kind of instrument was this? According to the definitions in the dictionaries contemporary with Pourel David's harp was synonymous with psaltery or nablium. The psaltery is a zither plucked by the bare fingers or by a plectrum introduced in Europe during the 11th century and was used in art music until the end of the 16th century. In Germany during the 18th century the word "Davidsharfe" was used to denote the common harp without pedals to differ it from the "Spitzharfe", or the arpanetta, which was a small psaltery in wing shape meant to be placed on a table. One of the few preserved arpanettas is kept at the Skaraborg County Museum in Sweden. Particularly interesting is the fact that this arpanetta is almost contemporary with Pourel. The harp that king David originally played upon probably was a "kinnor" or lyre. It seems likely that the instrument Pourel played was an arpanetta. Later Pourel also was called "harponist" [harp player]. The musicians of the university, of which Pourel probably was an active member, practised in the exercise-room of the dancing-master, but also in the home of Rudbeck where many instruments as shown above and a lot of printed and manuscript music were kept. Smaller "concerts" probably were performed even if the concept of "concert" in this period was unknown in Sweden. The musicians of the university also took part in festival and commemoration days, scientific celebrations and in other academic contexts. Incidentally Pourel during his stay in Uppsala ought to have been acquainted to Johan Arndt Bellman, the grandfather of Carl Michael Bellman, the famous Swedish poet and musician. Johan Arndt Bellman had arrived to the Uppsala University in 1678 and made himself known as a musician and a singer. He played the lute and his copy of Charles Mouton's Pièces de luth, which he bought in Paris in 1699, is now kept in the Musikhistorisk Museum in Copenhagen, Denmark. Aldenstundh fordom fransöske språkmästarens Mons: Pourels son Israel Pourel ben:d är till Upsala ankommen i upsåth at här idka sina studier hwar till han icke med medel försedd är uthan förtroor sigh kunna niuta något beneficium till studiernes understödh, allenast någon säkerhet wore om hans Person, studier och qvaliteter kunnig at han wore wärdt at något uppåkåsta och hans upkomst derigenom stodo till förmoda; så hafwer iag efter anmodan icke annat kunnat uthan härmed betyga hwadh som mig om honom kunigit är: Nembl. Uthi Upsala är han en Studiosus af den profect som wäl swarar emot hans ålder, och hafwer synnerlig inclination till studier, hwar till honom icke fattas godh hogh och willia och är af Gudh begåfwadh med särdeles goda naturens gofwor, så at förhoppning är, det han någon märkelig progress derwidh göra kan allenast han icke för medellöshets skull eftersath warder. Derhoos är han och i Musicen färdigh, så at han strax är worden antagen och afhållen widh musicen i Upsala för sin färdighets skull i den konsten. Hwilcket iag här med i sanning attestera will, och skiäligen honom sådant wittnesbörd meddelar der det kunde honom till någon befordring och fromma lända. [The late French language master Monsr. Pourel's son, called Israel Pourel, has arrived to Uppsala in order to pursue his studies for which he does not have the required means. However he hopes to receive some benevolence for the support of his studies if some certainty could be provided that someone who knows his person, his studies, and qualities, could expect that it would be worthwhile spending something on him and his subsistence. By request I cannot deny to certify by this letter what I know about him. In Uppsala he is a student of the standard you would expect from a person of his age and he is very inclined to studies and he does not lack abilities and good intention. He is also by God endowed with particularly excellent natural talents. One may suppose that he may progress in a remarkable way unless he will be neglected through lack of means. In addition to this he is also so skilled in music that he immediately was engaged in the music of Uppsala on account of his capability in that art, which I by this truly will certify and give him a fair testimony which could be useful to him in his promotion and for his benefit. In the archive of the Uppsala University a letter in Latin from Israel Pourel to professor Laurentio Normanno, dated Stockholm 20 July 1686, is kept. As is shown by the book collection in his estate inventory quoted below it seems reasonable to believe that he mastered his Latin. In another undated letter from Pourel, possibly addressed to de la Gardie, Pourel offers his services to entertain at the court, among other things playing on the David's harp: "så wähl genom Rättwysa som qvaliteter et meriter kunnades iagh elliest dertillmed kanske något contribuera till Hans. Kl: May:tz och dess höga Kl: huset plaisir och contentement medelst presenterande på er Theatre och tracterande af det kostbahreste rareste och betydeligaste musicaliske instrument mener en Kongh Davids Harpa i fall derom skulle påfordras... [as well by justice (?) as skills and qualifications I could also perhaps contribute something to the pleasure and satisfaction of His Royal Majesty and the royal household presenting at your theatre and playing on the most precious, rarest and most important musical instrument, that is a King David's harp in case this should be required...]". However there are no sources confirming that Pourel ever was employed at the royal court and this indicates that his letter did not lead to an engagement. During his whole life Pourel seems to have lived under difficult economic circumstances. A letter, dated 1 June 1689, from him to his uncle Samuel Agriconius shows that Pourel was in an immediate need of money to pay a debt amounting to "152 Gulldens", equivalent to 300 copper dollar. In the beginning of this article I also mentioned that Bertram Pourel had left a sealed trunk, which he had pawned by the shopkeeper Johan Adlercrona. Not until 20 December 1689 the Inland Revenue Department decided that "Sterbhuuset skall fåå bem:te Coffert" [the estate of Bertram Pourel should receive the aforesaid trunk]. The trunk had obviously been transferred to the Palace Chancery and the widow of Bertram Pourel urged fervently that the trunk, with its contents of silver among other things, should be handed out to the heirs. The Court of Appeal therefore decided on 29 March 1690 that "kunnandes Hustru Catharina Grubb... uthföra det bästa hon kan och gitter [the wife Catharina Grubb could carry away the best she can and as she likes]". A receipt is preserved, dated 18 June 1690 and signed by Israel Pourel, his mother and his brother Chrispinus, concerning the consignment from the Palace Chancery of a number of objects of silver (goblets, pots and bowls). These objects probably came from Bertram Pourel's trunk. Israel Pourel's mother did not benefit much from the silver as she died on 26 November 1690. Her new husband Christoffer von Bergen died much later, in 1719, as a mayor of Norrköping. Moreover in his estate inventory "1 luta med foder [one lute with case]" is mentioned. From 1695 there are a few entries concerning a lawsuit which Pourel had against a Mrs. Maria Bader about a clavichord. According to the minutes from this lawsuit Israel Pourel had lent his clavichord to a friend of his, the student Jacob Forster, who in his turn and in connection with his depart from Stockholm had left it with Maria Bader. Maria Bader was not willing to part with the clavichord until Pourel had proven that he really was the owner of it. As witnesses Pourel summoned Jacob Nordenstedt and Johan von Bergen who affirmed that the clavichord really belonged to Pourel. The court also decided that Pourel should get the clavichord back. Johan von Bergen was the brother of Christopher von Bergen, who in his turn was Israel Pourel's stepfather. At this time Johan von Bergen served as treasurer at the admiralty. Jacob Nordenstedt possibly was a fellow student to Pourel and was in the mid 1690s employed at the Board of Administration and the National Archives. About 1697 a correspondence started between Pourel and the authorities concerning an assignation on Lars Månsson Falkensten's salary amounting to 600 copper dollar. It was probably the son of Lars Månsson Falkensten, Matthias Larsson, who had assaulted Bertram Pourel to death in 1667. Israel Pourel claimed for the assignation on Lars Månsson Falkensten's salary, which the Inland Revenue Department already on 2 May 1667 had given to the surveyor-general of customs Drakenhielm. On 26 July 1697 the Government dealt with a petition from Pourel and on 9 July 1698 the public prosecutor Hoffren investigates a new petition from "Studenten och Harponisten H:r Israel Pourel [the student and harp-player Mr. Israel Pourel]" and states that Pourel cannot be considered to be entitled to the assignation. This was also the decision of the Government on 31 October 1698. Following this decision Pourel in 1699-1700 wrote a long petition, filled with digressions, Latin quotations and with references to Roman law. He obviously was well prepared concerning the subject. Pourel demanded in grandiloquent words to get the assignation of 600 copper dollar as well as to get the 300 Rixdollar which "för min S: faders giorde upwachtning wid det Kongl: Hofwet i Hennes Högst S: M:tz Drotning Christinas tydh, af hwilken han till fransösk Hoffspråkmästare kalladh blef, för mig innestående warit... [have been deposited for me on account of my late father's attendance at the Royal court in the time of the late queen Christina, by whom he was appointed French language master of the court]" According to Pourel the money was intended for a "Musicalisch Kong Davids Harpa [a musical King David's harp]". In this context Pourel also got the opportunity to refer to his musical activities in Uppsala: "... iag den endeste in Seminario Regni Academien warit, som dette musicalische Instrumentet [Davidsharpan] tractera weet uthom det notorium ähr, så bewyser iagh sådant med den Högwyrdige, Höglärde och uthi Republica Literaria mycket nambnkunnige H:r Doctor Olof Rudbeckij... wittnesmåhl... [... being the only one in the seminar of the university who knows how to play this musical instrument ... which is also proven by the testimony of the venerable, most learned and in the literary society most renowned Mr. Doctor Olof Rudbeckij]". Subsequently Pourel quoted from the letter above by Rudbeck dated 1693. The six pages long letter from Pourel never seems to have been dealt with by the Government. Inventariebok f. 158-161v showing that Pourel had owned four music copy-books. Nu lägges ned i ro den mången rolig giorde. Man honom uti lag dock altid nöjd försporde. Fast han med tunger fot måst Tidsens öde bära. You always knew that he in company was pleased. On 9 December 1709 the grave of "Israel Pouril och hans broder [Israel Pourel and his brother]" at the S. Klara churchyard for unknown reasons was opened. Whether or not there are any original compositions by Pourel in the manuscript cannot be confirmed even if there at the present state of knowledge seems to be a few unique pieces (nine in total), which may have been composed by Pourel. Otherwise much of the contents is common repertoire found in many lute tablature manuscripts from the 17th and the beginning 18th century. The contents also mirrors the repertoire that was popular in Sweden at this time. In fact some of the pieces (La belle homicide, C'est l'amour..., Strobel's Gique, Courante l'Immortelle, Combat naval) belong to the ten most popular pieces in Sweden during the Great Power Period. It is hardly likely that Pourel directly was involved with the manuscript as it probably not was completed until the 1710s, that is after Pourel's death. On the other hand there is a strong connection with another lute tablature manuscript in the Lund University Library with the shelve mark Wenster G 37. Both manuscripts were parts of the big collection of music which formerly belonged to the conductor and organist Emanuel Wenster. It is probably the same person who has written the manuscripts Wenster G 34 and G 37. They have similar contents and the Danish lutenist Daniel Holst is mentioned in both manuscripts. In Wenster G 37 there is also an owner's signature: P:P: Platin Malmöö den 30 Novemb: Ao 1712. Peter Platin (c. 1670 - 1754) was a doctor and a chemist. He may have owned both manuscripts and be the person who has written them during his stay in Malmö in the 1710s, when he cared for people struck by the plague. After Platin had moved to Medevi to become chemist at the Medevi Spa. the manuscripts perhaps remained in the Malmö-Lund region and were taken care of by musicians there. I have not been able to find any connections whatsoever between Pourel and Platin. The other lutenist mentioned in the manuscripts, Daniel Holst, became burgher in Copenhagen in 1691 as a "Fiologamist [viola da gamba-player]". Nor seems there to be any connection between Pourel and Holst. These lute tablature manuscripts are of a particular importance as they belong to the very few in Sweden which in some way can be connected with professional musicians. There is no obvious explanation to the fact that the lute pieces of Pourel are to be found in this particular manuscript. Its provenance place it a long way from Stockholm where Pourel lived during the later part of his life. We also lack other musical traces of this poor but obviously talented musician from the Great Power Period of Sweden. This article was first published in Luths et luthistes en Occident - actes du colloque 13-15 mai 1998. Paris 1999, pp. 217-233. On Niewerth see Hinrich Niewerth - Lutenist at the Royal Swedish Court in The Lute XXIV Part 2, 1984, pp. 69-75. Israel Pourel is not mentioned in Erik Kjellberg's dissertation on the music at the Swedish court ca 1620 - ca 1720, Kungliga musiker i Sverige under stormaktstiden. Vol 1-2, Uppsala 1979. COURT ET DROIT SENTIER A la LANGUE FRANÇOISE thet är: En Rätt Gånge-Wägh eller Geenstigh. Till thett FRANSÖSKE eller FRANSYSKE Språåket. Par BARTH: POUREL DE HATRIZE. A STOCKHOLM, Chez JEAN JEANSSON. ANNO 1650. This was reprinted in 1690, but no copy has been located. DEO. REGI & AMICIS TABVLA RUDIMENTORUM LINGUE GALLICÆ FUNDAMENTALIUM.... BARTHOLOMÆO POURELIO. VPSALIÆ Excudit Henricus Curio S.R.M. & Acad. Vpsal. Biblioph. 1664. The surname Pourel has also been located to the villages Baccarat in Meurte-et-Moselle and Corcieux in Vosges. I have not been able to locate it to any other places. Ravenelle, M. Hatrize et son histoire. S.l.s.d. Kjellberg, E. 'Magnus Gabriel de la Gardie och musiken' in Magnus Gabriel de la Gardie. Skövde 1980 pp. 73ff. Kyhlberg, B. Musiken i Uppsala under stormaktstiden. 1. Uppsala 1974 p. 285. Uppsala universitets arkiv F Va:. Uppsala universitets matrikel I-III. Uppsala 1900. Norlind, T. 'Musiken i Uppsala under 1600-talet' in Kult och konst 1908 pp. 37f. Walin, S. 'Musikinstrumenttermer i äldre svenska lexikon' in Svensk tidskrift för musikforskning 1948 p. 17. Sohlmans musiklexikon 5. Stockholm 1979 p. 125. Vi äro musikanter alltifrån Skaraborg. Falköping 1983 pp. 160f. Moberg, C-A., 'Olof Rudbeck d.ä. och musiken' in Rudbecksstudier. Festskrift... Uppsala 1930 pp. 176ff. Norlind, T. 'Musiken i Uppsala under 1600-talet' in Kult och konst 1908 pp. 29ff. Stockholms stadsarkiv, Stockholms Norre Förstads Civilprotokoll 1695, p. 747 (13/129) and p. 755 (19/12). I am greatly indebted to François-Pierre Goy for his invaluable help in identifying the pieces in the manuscript. This Gavotte actually begins on the second and third staffs of fol. 42 and continues and ends on the fourth staff of fol. 41v. This discrepancy has not been observed by Rudén in his Music in tablature. Stockholm 1981 p. 31. I'm grateful to François-Pierre Goy for this information. This Menuet has not been observed by Rudén I'm grateful to François-Pierre Goy for this information.